I always loved creating symbols and playing with letters. That’s why I was engaged in logo development, also for myself, pretty early. In this post I am presenting my more recent logos and the development of my new (2018) version of my dynamic logo. It consists of the æ from the word aerozopher, the alchemy symbol for air and the circle/ouroboros. The cycle of breathing in and breathing out is the perfect analogy for the sinus graph of life, the taking and giving of life in this polar reality. Those aspects you can find in my artist alias too. Not for nothing is the lung the greatest surface of the human body (Read more about the importance of right breathing here). Breaking through this cycle, as well as cutting yourself off the life-connecting element of air, leads to your destruction and death. The Ouroborus for me is the ultimate symbol of allconnectedness, infinity and repeating of patterns. *1: Cellsquare Logo for my Cellsquare Series and I also use it for my Instagram posts. *2: The Glitch Version inspired by Cyberpunk Visuals. 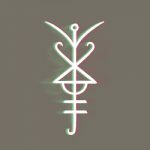 *3: The Elf Sigil. A completely different style I like using in Fantasy pieces – for example the Fairy Blast. *4: Modern Stroke AE Ligature. I used this one pretty often last year. A more handsigned approach. *5: The Brush Swing AE Ligature. For rough and traditional looking pieces. As prework I had Benno Gabler fill a few sheets of paper with drafts and experiments regarding the lowercase a and e letters. I hope you enjoyed this very different post from me and maybe are inspired to sit down and think about your own visual representation online. Do you want your own Logo too? I wanted to mention, that logo development is one of my specialties in graphic design and if you need one feel free to send me a mail to aerozopher(at)posteo.net. I like doing very minimalist graphic logos aswell as (black)metalesque obscure ones. My friend Benno Gabler is there for typography-heavy stuff like Fraktur style Handlettering. Benno’s homepage is still under construction. To see my recent Logo Portfolio click here (updated 10.04.18). Excellently written by someone who knows what he’s doing! Can you tell me what platform are you making use of on this web site? I found your web site from Google and I have to state it was an excellent find.